And Yet Another Book Report: “Travels With Charley: In Search of America” by John Steinbeck | So Many Exciting and Beautiful Places! I have read a few of John Steinbeck‘s novels in the past, and generally found them to be quite depressing. Once I was no longer required to read them for school, I chose to avoid him as a writer. However, since I am determined to read all of the books listed in the Atlas Obscura article by Richard Kreitner and Steven Melendez: “The Obsessively Detailed Map of American Literature’s Most Epic Road Trips,” I had to give Steinbeck another chance. 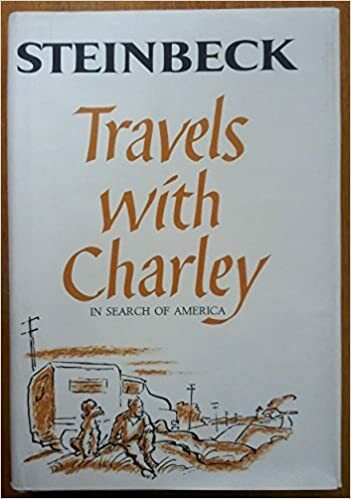 I much prefer Travels With Charley: In Search of America, written about a 1960 road trip he took, accompanied by his dog, Charley. At the age of 58, Steinbeck purchased a truck and had it fitted with a camper, which he named Rocinante, and set off from Long Island, NY, on a 75 day journey which took him through 34 states. He thought he had lost touch with the people he had been writing about for years, so hoped to rediscover America and its inhabitants. He writes very descriptively of the people he met and the adventures (or misadventures) he had along the way. After traveling for several thousand miles, Rocinante blew a tire. Steinbeck’s description left me laughing: “And in Oregon on a rainy Sunday, moving through an endless muddy puddle, a right rear tire blew out with a damp explosion. I have known and owned mean, ugly-natured cars which would have done this thing out of pure evil and malice, but not Rocinante. After reading prose like this, how could I not forgive him for his depressing novels? At the time that he was on this journey, Steinbeck was suffering from heart disease, and he was discouraged from taking this trip. He was fortunate to have survived the incident described above. Then, when I read of a gathering with family members in California, I was reminded that some things never change. Although the political discourse was publicly civil at the time, it could be anything but that indoors. His political views differed from his sisters, and there were heated discussions about John Kennedy being a so-and-so and Robert Kennedy buying sacks of votes, how anyone could reconcile Richard Nixon, what about Checkers, and did no Republican ever buy votes? Several critics claim that the travelogue was partly fictionalized. It’s argued that it would have been impossible for him to talk to so many people and never be recognized. It’s also argued that he was not alone for most of the trip, and that he spent many nights in very nice hotels or homes of friends. It really doesn’t matter to me. He captured the spirit of the country he drove through and of the people who populated it. I found it an enjoyable read, one that was hard to break away from. I’m still not interested in revisiting his novels, however. This entry was posted in Book Review, John Steinbeck, Literature, Road Trip, USA Travel and tagged John Steinbeck, Travels With Charley. Bookmark the permalink.